A technique which revolutionizes cell culture by allowing the continuous production and collection of cells, has been developed by scientists at Newcastle University. 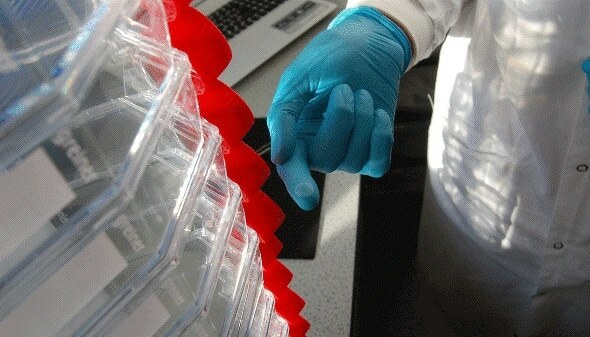 The process removes the limit on the number of cells that can be grown in a culture dish, which until now has been strictly confined by its surface area. The research published today in ACS Applied Materials & Interfaces reports how the Newcastle team have developed a coating that allows individual stromal cells to "peel away" from the surface on which they are grown. This creates more space so that further cells can grow in their place - continuously. The team has also demonstrated that the process works across a range of stromal cells including mesenchymal stem cells (MSCs). This allows us to move away, for the first time, from the batch production of cells to an unremitting process. Remarkably, with this continuous production technique even a culture surface the size of a penny can, over a period of time, generate the same number of cells as a much larger-sized flask. This concept also represents an important innovation for cell-based therapies, where treatments can require up to a billion cells per patient. With our new technology, one square meter would produce enough cells to treat 4,000 patients, while traditional methods would require an area equivalent to a football pitch! Our new technology also offers complete control over the rate of cell production, so it could be scaled up using existing stacked culture flasks to produce one billion cells per week, or scaled down so as to fit a bioreactor on the head of a pin. Traditionally, cells have been grown in the lab over the surface area of a flask and then detached chemically or enzymatically for use. The cells are created in batches with batch size limited to the area upon which the cells are grown. This limitation is a well-recognized bottle-neck in therapeutic cell manufacture, and one that current businesses are unable to meet due to a lack of a suitable alternative technology. The publication addresses this challenge, describing a special "peptide amphiphile" coating that allows adherent cells to reach a steady balance between growth and detachment. The self-detaching cells are then produced in a continuous bioprocess and available for use in a variety of downstream applications without losing their original characteristics. The potential reduced size of a continuous cell bioprocess has obvious advantages in terms of lower production costs and increased coverage and application. There are a number of cell-based therapies in later stage development and it is estimated that 10 million patients could potentially benefit from cardiac cell therapy each year. However, the traditional approach would require an area equivalent to that of Central London and Midtown Manhattan running simultaneously to produce enough. The concept of a continuous bioprocess is currently used to produce biopharmaceuticals such as vaccines and anti-cancer antibodies, but never before for cells. There is a fantastically high number of patients in need of cell therapy, such as those suffering from heart, cartilage, skin and cancer-related diseases. Our new technology provides a much-needed solution while saving costs, reducing materials and improving the quality and the standardization of the final product.